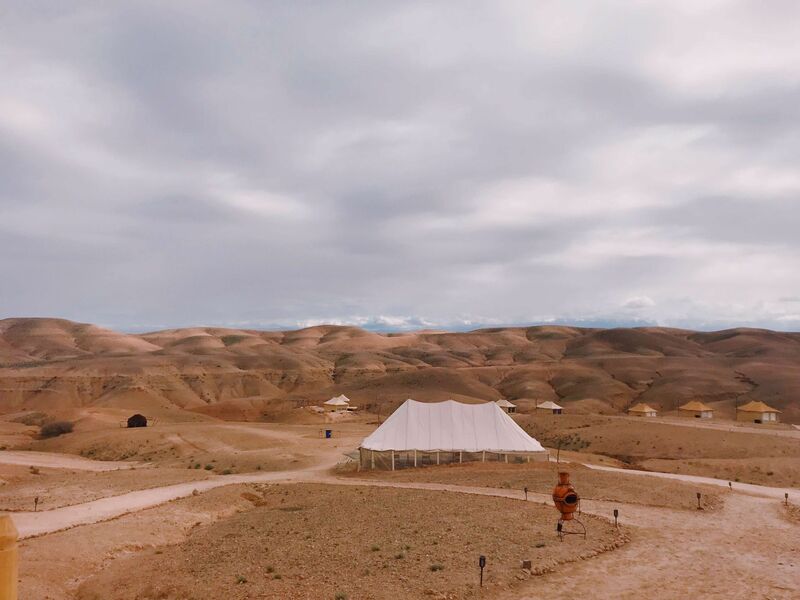 Staying in an Luxury Agafay Desert Camp! Visiting Morocco, I thought I’d be able to tick a visit to the Sahara desert off my travel bucket list. 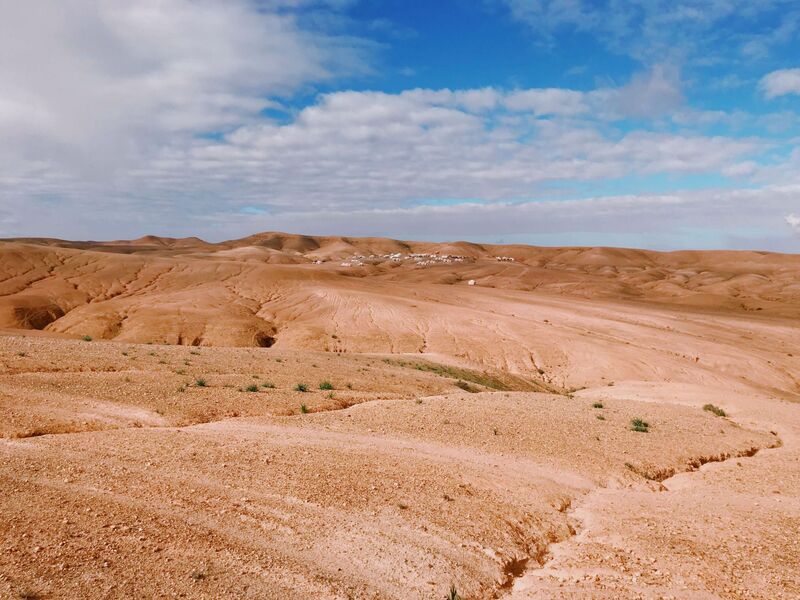 However, when I began researching my trip, I quickly found that the Sahara is difficult to reach and that it takes at least three days to get there, from Marrakech. 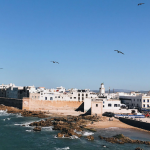 Since I was only spending a week in Morocco, I didn’t have enough time to make this trip. Thankfully I found the perfect alternative, the Agafay Desert, which is equally as pristine and beautiful, but it’s just an hour away from Marrakech! 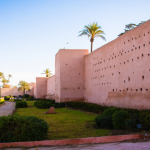 Many people simply do an Agafay Desert day trip, and while I’m sure that these Marrakech excursions are wonderful, they only allow you to spend a few hours in the desert. Therefore, as I wanted more time to appreciate the beauty of the Agafay desert, my mum (who travelled to Morocco with me) and I decided to stay overnight! 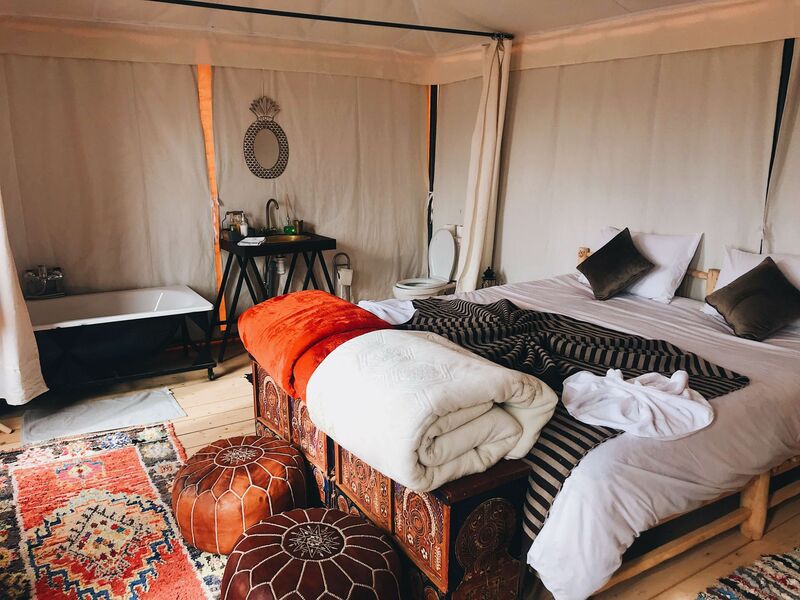 This way we would get to have some much needed down time (as the rest of our Marrakech itinerary was very full on) and spend a decent amount of time amongst the impressive dunes of the desert. 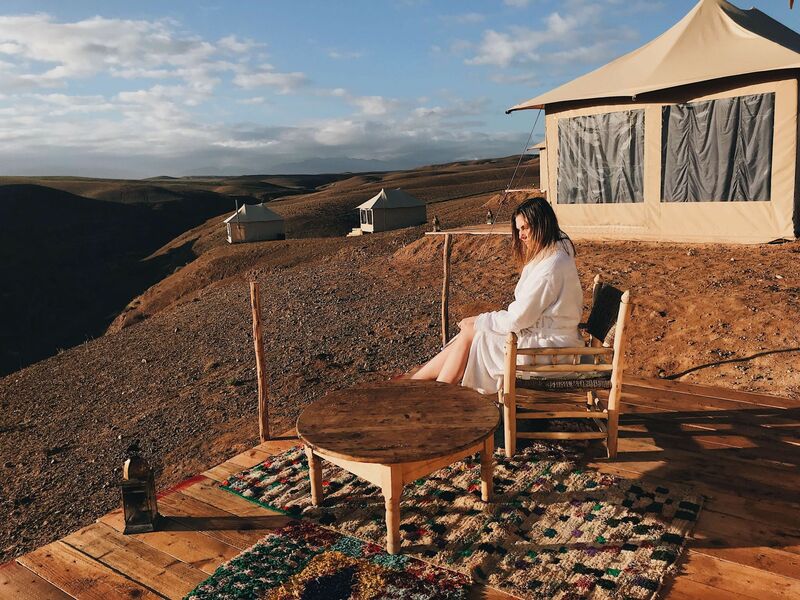 There are quite a few companies that appear to offer luxury camping experiences in the Agafay desert, but after doing some research online, my mum and I chose to stay in the originally named Agafay Desert Luxury Camp. Driving into the camp, I instantly knew we’d made the right decision, as its location is simply perfect! It’s located right in the middle of the desert, and there’s not another settlement as far as the eye can see, which is really what you want from this kind of experience! Other camps we passed on our way deeper into the desert were not like this at all, they were next to roads, or right next to each other, and I couldn’t help but feel relieved that our driver passed them by! More than this, the service at the Agafay Desert Luxury Camp was outstanding. For example, we were picked up from Marrakech at around 11am, and although check out was theoretically at 12pm the next day, we were told that we could stay as long as we wanted. Therefore, we got to spend almost two full days sitting in the sun and gazing at the beautiful views. In other words, it was the perfect escape from the craziest of Marrakech. The camp was not only relaxing, it is also lived up to its name as it was very luxurious! For example, the tent we stayed in was much nicer than a lot of hotel rooms. It was located right on the edge of the camp, meaning it had uninterrupted views of the desert and the Atlas Mountains beyond. 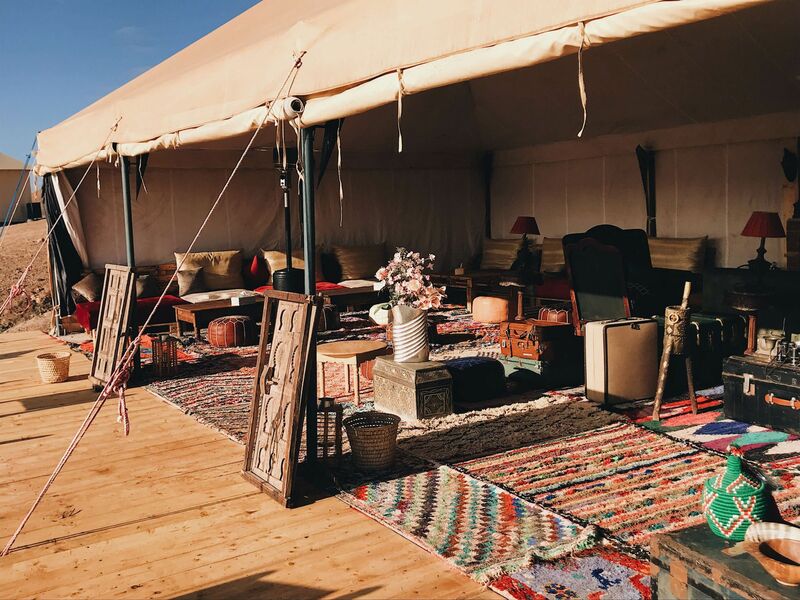 We were able to enjoy these breath-taking surroundings on a wooden deck situated at the front of the tent, which the staff even decorated with Berber rugs and comfortable chairs. Things only get better inside the tent, which came with a huge king-size bed and a generously sized single bed, which is normally used as a sofa/sitting area, but since I was travelling with my mum they kindly brought down extra blankets and bedding and made it up ready for the night. SIDE NOTE: if you visit the Agafay Desert in the winter months, the nights get very chilly! therefore all the tents come with a log burner, and ours kept us toasty warm throughout the night. Other facilities in the camp include a swimming pool (although it wasn’t filled up when we visited in the winter) a beautiful dining tent, and the main reception/breakfast tent which is the ‘hub’ of the camp. 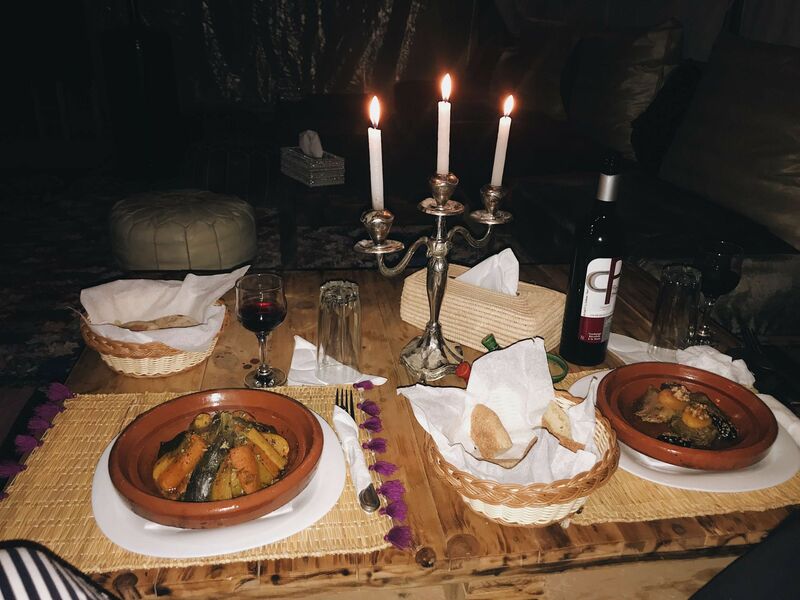 Taking a Marrakech desert trip didn’t mean we missed out on amazing Moroccan food either. For dinner, we were served a three-course meal, which included a gorgeous Tagine of either chicken, beef or vegetables. However, for me, breakfast was the star of the show, as we were brought a feast of bread, jams, pancakes, yoghurts, and so much more! It’s safe to say that we feasted like kings in the desert. 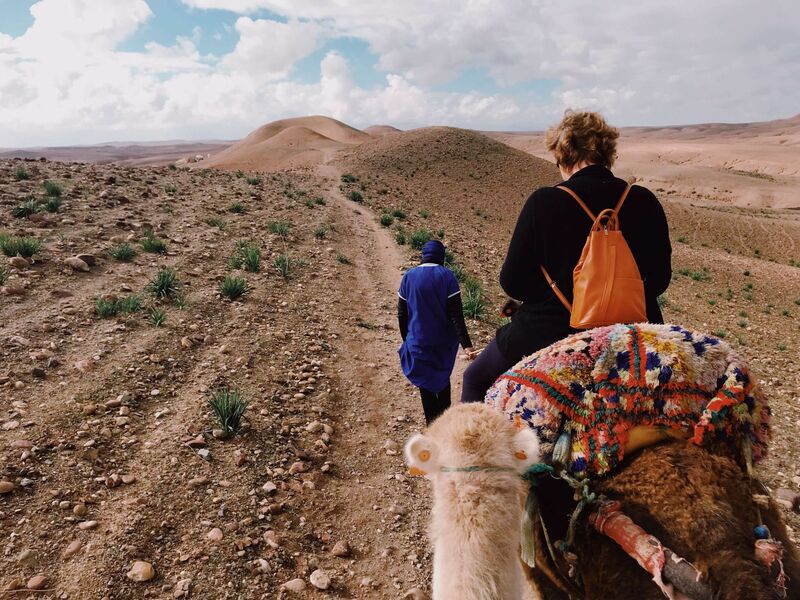 Many people go on Morocco desert trips to do three main things: Camel riding, Horse riding and quad biking. 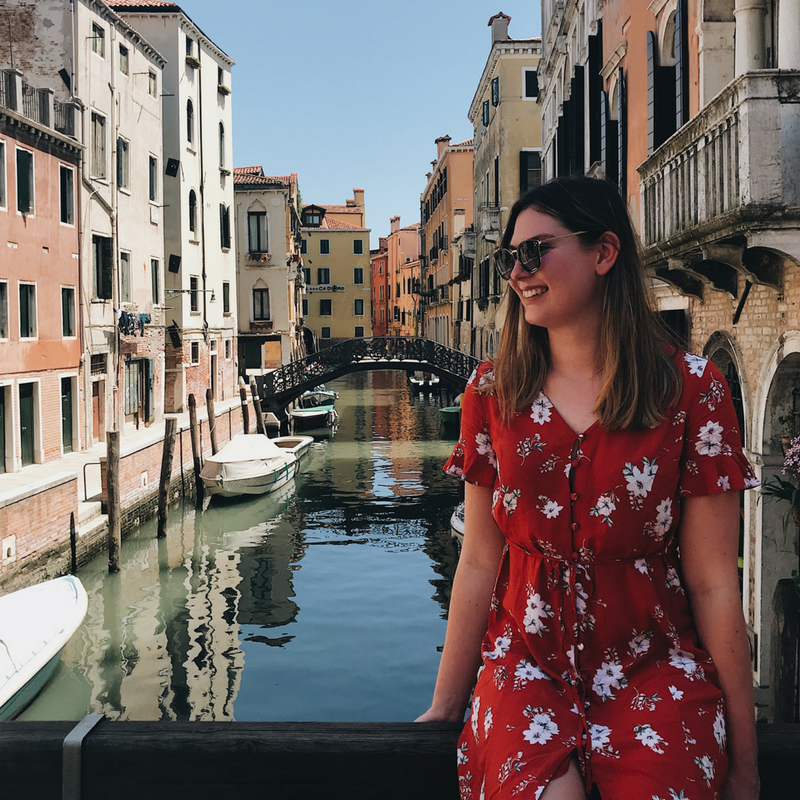 While you could do one of these on an Agafay Desert day trip, by staying overnight in the desert, the extra time will allow you to do several of these once in a lifetime activities! The Agafay Desert Luxury Camp offered us the opportunity to do these activities and more… On our first night, we had a luxury massage, which is such a unique experience to have in the desert! Then in the morning, we decided to do the most popular desert activity: a Camel ride. What I loved the most about this was the fact that the Camels the camp used were clearly very well cared for. They rested after out outing for a good few hours, and the handler didn’t carry a whip or hook to get the Camels moving. TOP TIP: When in Marrakech, and other cities in Morocco, you’ll see people offering Camel rides around the streets. Please avoid these as the Camels are not usually well cared for. Save the activity for the desert where the Camels get to live in a much more natural environment. 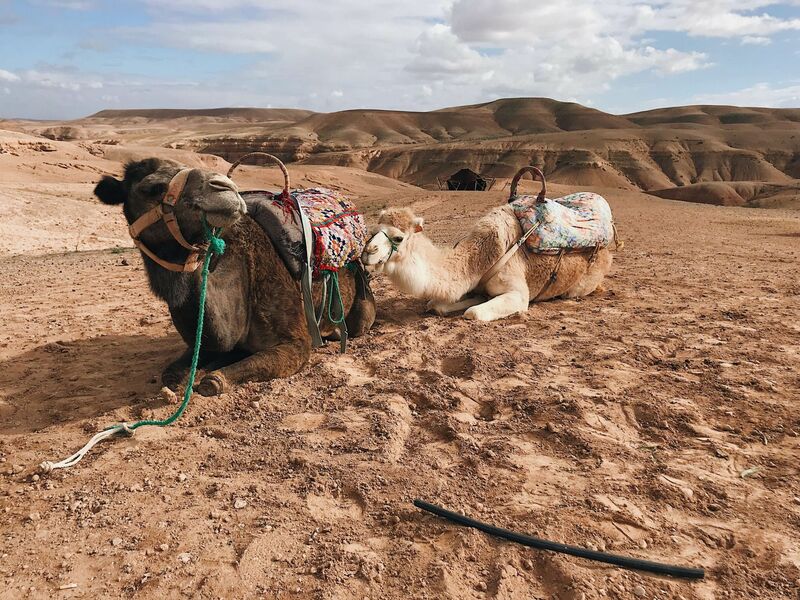 if you’re worried about Camel riding, check out these tips! Overall my time in the Agafay Marrakech, was my favourite part of my whole week in Morocco! I’d thoroughly recommend the Agafay Desert camp I stayed in because I truly do not have a negative thing to say about my time there. It was simply like spending two days in a dry, barren paradise! 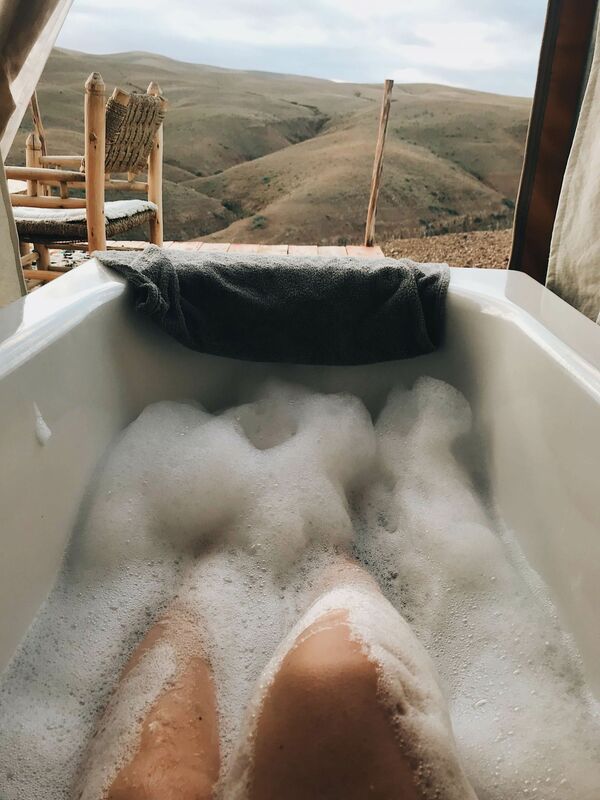 Wow, a bath in the desert, unbelievable! The food also looks amazing! Where do they get the water from?